In separate crashes in Queens, Manhattan and the Bronx, city motorists killed five pedestrians between Christmas and New Year’s Day. Four of the crashes, which took the lives of a child and three young mothers, were hit-and-runs. At approximately 8:45 a.m. on December 28, 11-year-old Miguel Torres of Jackson Heights was crossing at Northern Boulevard and 80th Street, in the crosswalk and with the light, when he was hit by the driver of a dump truck. A spokeswoman for the NYPD said that although the police originally stated the child was involved in a hit-and-run, police were actually able to track down the driver at the scene. “It appeared the driver was unaware they struck someone,” said the spokeswoman. No criminal charges had been filed by Sunday, but she said the case was still under investigation. A few hours after the incident, police found the driver of the 1988 truck in Park Slope, Brooklyn. He told police he didn’t know he had hit someone, tested negative for alcohol and had a valid driver’s license. Police said no criminal charges will be filed. If Queens District Attorney Richard Brown does indeed pursue a criminal case against Miguel Torres’s killer, it is a virtual lock that leaving the scene would be the top charge. Minus evidence of intoxication, a city motorist who kills a pedestrian or cyclist is practically guaranteed to escape charges for taking a life. 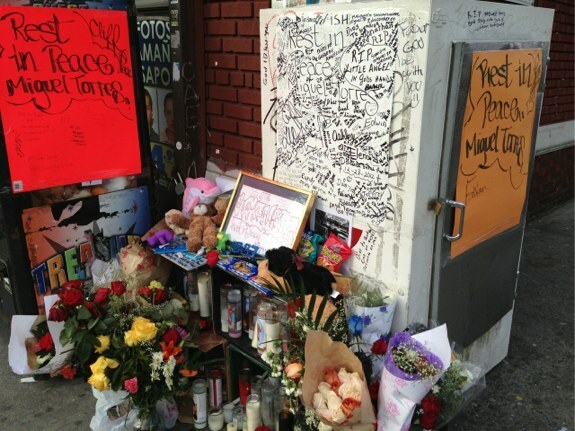 A memorial for Miguel Torres, killed in Jackson Heights by a hit-and-run driver who was not criminally charged by NYPD or Queens DA Richard Brown. Photo: Clarence Eckerson Jr.
On December 29 at around 6 a.m., Amanda Garcia was hit by the driver of a Nissan Altima on Westchester Avenue near Olmstead Avenue in Parkchester, according to the Daily News. The impact severely damaged the car, rupturing the gas tank, but the driver kept going. Garcia, of Pleasantville, was the mother of a three-month-old boy. She was thrown into a parked minivan with such force that it looks as if the vehicle was rear-ended by another motorist. At around 8:25 p.m., 33-year-old Aileen Martinez was run over by the driver of an MTA express bus in Manhattan. Martinez was on her way home from work, to her dog Ricky, when the bus driver struck her while making a left turn from 59th Street onto Seventh Avenue. She was pronounced dead on arrival at St. Luke’s-Roosevelt Hospital. Less than three hours after the crash NYPD had issued its standard “no criminality suspected” statement to the press. A Daily News report that Martinez was hit by a yellow cab driver before she was struck by the bus was brushed off by police. Martinez was a native of the Dominican Republic, and her mother in that country was stunned by news of the death. “She’s in very bad shape. She kept saying it’s her only daughter. She’s devastated,” said Jose Perez, a friend of Martinez. He added that every month, Martinez sent $200 to her mom. In another fatal crash, according to a flippant, pun-heavy account from the Post, in the early morning hours of December 15, Ronald Sinvil “fell into” a moving city sanitation street sweeper on Flatbush Avenue outside Barclays Center. The 36-year-old father was pronounced dead at Kings County Hospital. No charges were filed. Streetsblog will follow developments for each of these crashes. Ronald Sinvil, Aileen Martinez, Maria Beria, Sheena Mathew, Amanda Garcia and Miguel Torres will be added to the victims named in our 2012 memoriam post. @13f3bd249086fc844cee87a932dc4a08:disqus Normally our coverage of traffic fatalities includes contact information for relevant NYPD precincts and City Council members. Unfortunately, sadly, outrageously, it is not always possible to include because the number of deaths makes it impractical. If you are so inclined, you can reach your City Council member through this site. To push for improved traffic enforcement where you live, a good start would be to attend your precinct’s community council meetings. Precinct meeting and contact info can be found here. Just wanted to chime in and reinforce Brad’s point. Speaking as a Transportation Alternatives staffer, we get our strength from folks like you telling your elected representatives what you think. So reach out!In particular, you should sign TA’s petition to tell your electeds that NYC needs speeding enforcement cameras and sign your name to TA’s letter to Ray Kelly demanding the NYPD investigate serious traffic crashes. Also, follow up on Brad’s recommendations below and make a quick phone call, or dash off a quick email. That’s how we’ll win change on these issues. Ray Kelly needs to go and be replaced by someone who is willing and capable of doing this job. Current NYPD behavior is an insult to all New Yorkers. People get killed and nothing gets done. I am sure this kind of data presentation would help your fight against motorized terror. Anyway, good job. Keep it up!